It feels so wonderful to be back in my kitchen! I have been a busy bee today, cooking away, motivated by the Fall spirit. Fall flavors are everywhere...apples at the Farmer's Market, pumpkin spice coffee at Trader Joe's, cinnamon candles at Target! Fall certainly has become a trendy season. I am ok with this, especially when it comes to apples. Even though apples are available all year round, there is something about the healthy fruit during it's peak season. I decided to attempt apple sauce for my first Fall recipe this month. It was actually a lot easier than I thought it would be! First, the apples. I don't think I realized how many different types of apples there are! I chose to mix a few different types for the sauce, Magna Bonma NC Heirloom, Virginia Beauties and Jona Gold. During this season, I think any apple would do as long as you like the flavor. Be sure to taste the apples before you cook with them....same concept as only cook with wines that you drink! Then, the added flavors. I have always been a fan of cinnamon apple sauce, so decided to add a cinnamon stick. After making the first batch, I don't really think the sauce needed any sugar since the apples are so sweet by themselves. However, I added a little maple sugar to add in a little extra comfort! Add all the ingredients into a slow cooker and place on high for 3 and 1/2 hours. Stir the apples every hour to prevent the skins from sticking to the bottom a bit. Keep the apples on warm for an hour to let them cool down a bit. 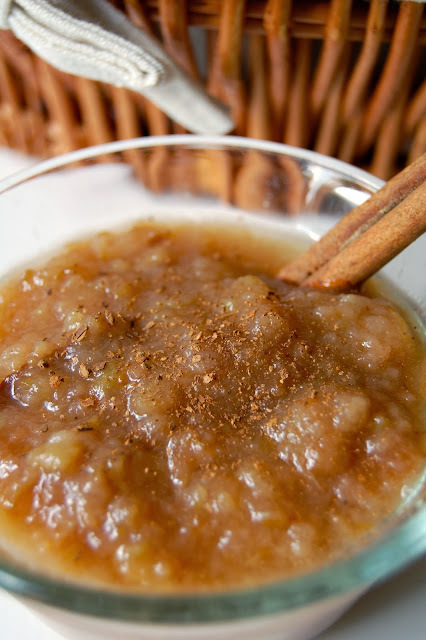 Remove the cinnamon stick and pour the apples and liquid into a blender or food processor and mix up. We like chunky apple sauce here, so only pulse a few times. Let the apple sauce cool and store in the fridge for up to 2 weeks, or freeze.